Adobe Stock: Will it Change the Way You Work? Depending on how long you've been around, you probably use stock photography every day. It doesn't matter if you are a print designer or a website design, or you create mockups, stock photos are an essential part of creating a professional design for your client. Adobe recently announced that they had acquired Fotolia, for the sole purpose of providing quality stock photography to Adobe Creative Cloud members in a unique way. After months of integration work, the result is Adobe Stock Now, not only do Creative Cloud members who want to access and manage a huge library of stock content, the integration of Creative Cloud with Adobe Stock also solves some problems that have plagued designers for years. Think of how many times you have been working on a client project that required high-level stock photography. You spend time searching for just the right image. You either pay per download, you purchase credits, or you have a certain number of allotted downloads per month. You spend your valuable credits downloading an image only to realize it just won't work. It's frustrating, and it's a waste of money, but you add the image to a folder on your hard drive, hoping to be able to use it somewhere else. You end up scrapping the image and wasting your time, your money, and your revenue. 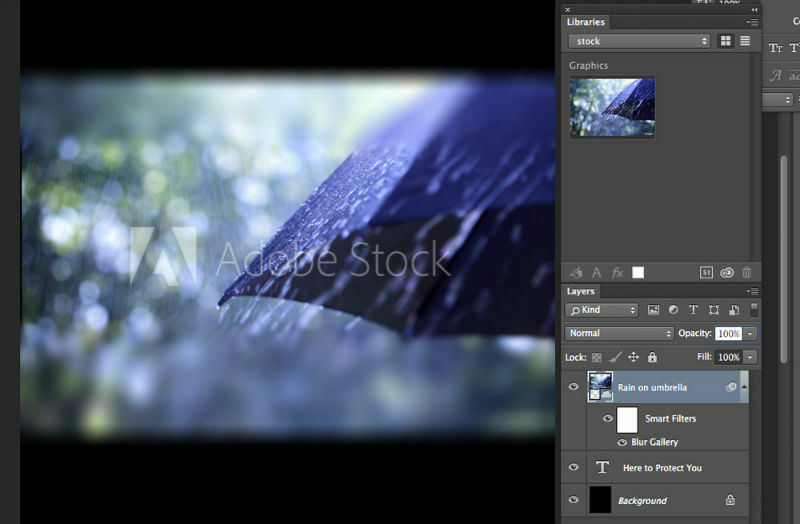 While you are inside of Photoshop CC, you can click to link directly to the Adobe Stock website. When you arrive, you can search for images with specific keywords, which is typical of any professional stock photography site. When you find the right image, you can add the watermarked image directly to your Creative Cloud library, which makes the image immediately available in your Photoshop CC, Illustrator CC, or InDesign CC (and Premiere Pro CC and After Effects CC) apps, where you can easily add it to your design. You can try out the watermarked version, adding effects to it, and making sure it is right for your creative vision – all before making a purchase. No longer will you have to download an image and spend your valuable credits, only to find that it just doesn't work, or that you'll have to spend a ton of time editing it to make it work. You can try out an image, and if it doesn't work out, you can search for one that does. You can try out the next one, which might be a better fit. This makes your work easier and more satisfying, because you are free from monetary pressure, or fear of wasting money or resources. Another bonus to this approach is that you can apply effects to the watermarked image, such as filters, etc. Once you are convinced you have made the right choice, you can use your Adobe Stock credits, or you can make a one time purchase, and the full image will be instantly updated and brought into your file in place of the watermarked image. This works with all open documents containing this image. Imagine creating a promotional poster for an event and using the same artwork in a banner for their website. You try it out in both documents to make sure it will work and that it looks just how you envisioned, and then you license the image, having it instantly update in both places. Being able to add an Adobe Stock image directly into your library means that you don't have to worry about your own servers, storage, or hosting the image where the rest of your team can access it. That's all handled by your Adobe Library. Anywhere you have an Adobe licensed machine, you can access your stock images, And if other team members are working on a project for the same customer and need access to an image another team member has licensed, a shared Creative Cloud library makes that easy. Many companies have an entire team of designers with different capabilities. Some may be focused only on print advertising, while others may be focused on web and digital design. With access to their Creative Cloud Library, the entire team can have access to all the project images and assets for a particular client at any time, as long as you’re using a shared Creative Cloud library. You don’t have to worry about emailing files or using services for sending large files. If it’s in your library, everyone can access it. This is especially useful for remote teams who may be stretched out across different time zones. You also don't have to worry about large files, or expired download links. In the example, I have created a basic letter-sized document. To look for a suitable image using Adobe Stock, you can get there in two ways. The first way is to go to File> Search Adobe Stock. The other is to click the "Search Adobe Stock" icon in the Libraries Panel. 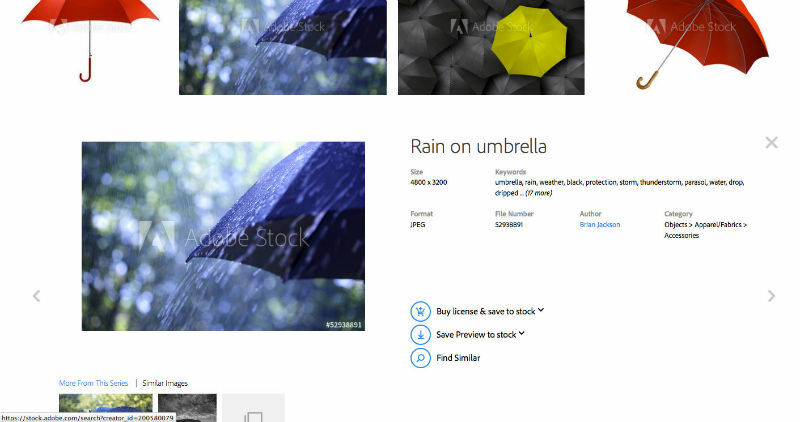 A new tab will open up in your active browser, taking you to the Adobe Stock website. It is important that you are logged into your Adobe account for this to work properly. Search for the image you want. 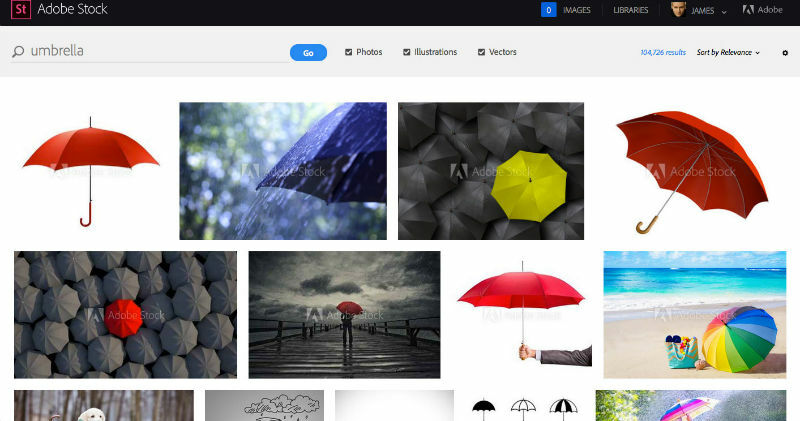 I did a search for umbrellas, which returned more than 100,000 results. When you find the one you want, click on it to bring up the large preview. You'll see an option on the right that may say "save preview to desktop" but you can click the down arrow to reveal a menu that allows you to save it to a specific library in your Adobe CC account. You can create a number of different libraries to keep your images organized. This allows you to keep track of files on a per-project basis. Once you have downloaded the preview image (complete with watermark) to your library, return to Photoshop, where you'll see it in your Libraries Panel. If you don't see that Panel, go to Windows> Libraries and click on it to make it active. Bring the image onto Photoshop's canvas by clicking and dragging the image from the Libraries Panel to the canvas. You can apply filters & effects to the watermarked image, just like you would any other image. The image is automatically brought in as a Smart Object, so any filter applied is generated as a Smart Filter. You can see from the preview I added a Tilt Shift Blur to the image. Once you're happy with the image and ready for the full resolution version without a watermark, go to the Libraries Panel, right-click on the image and click on License Image. If you have credits, you can use those, or you can go to the site to make a one-time purchase. This is where it really counts. You need stock photography for your design work, without breaking the bank. Overhead can be one of the major factors that ends up causing a business to close its doors. Adobe kept this in mind, with their tiered pricing. I was really impressed with how their prices compare to other big stock photography companies. 10 Images/Month – $29.99/Month Note: With an active Creative Cloud Membership, you can save 40% on a annual plan paid monthly. 10 Images/Month – $49.99 with no contract. You benefit in several ways with the smaller plans. If you only need 1 stock image, but it's the perfect one, you can download it at any size at only $9.99. Other sites charge you for a single image, depending on the size of the image you download. A web image may be $3, while a high resolution, print-ready image may be $25+ for a single image. With the 10 images per month plan, it’s cost effective to use a few stock images per month, which is perfect if you’re just starting your business. The major added advantage to this plan is that you can rollover up to 120 images of your unused images. This is great if you have a few slow months, and then suddenly business takes off. You aren't stuck with unused images, or forced into buying more images when you get a surge of new business. Another benefit: if you use up your images for the month, you can buy more images at a pro-rated price (specifically: 10 percent of your normal monthly rate.) If you’re a Creative Cloud Membership, you save 40% on an annual plan paid monthly. If you're a power user with a lot of steady business, 750 images per month is a great deal. In fact, it's one of the best I've seen. A colleague of mine uses a popular competitor, and he pays $179 per month for 360 images. If you're looking for an all-inclusive package in terms of design software and professional stock photography, Adobe Creative Cloud and Adobe Stock are a killer combo. You can work easier than ever before, without being stuck with images that just didn't work for the project. You'll cut down on lost resources, and you'll work faster and more efficiently, moving files into a library that your entire creative team can access at any time. You'll also save money and cut down on overhead, choosing a cost-effective stock photo plan that is right for your business. Adobe Stock is easily considered a game changer.